In order to make internal quality assurance (IQA) systems work sustainably for the enhancement of the quality and relevance of higher education services, it is necessary to identify innovative and cost-effective solutions so that much needed financial and human resources are not drawn away from academic core processes (teaching and research). It is also necessary to find solutions to IQA systems that can successfully function in a developing country context where human and financial resources are scarce and where quantitative data and evaluation results may not be easily generated. IIEP launched in 2014 an international research project to generate knowledge to provide evidence-based policy advice to national and institutional higher education leaders on existing innovative and cost-effective solutions for IQA systems in universities. This work, along with an international survey, helped inform the publication Quality Assurance: Enhancing higher education quality and graduate employability. This synthesis provides useful guidance for national and institutional policy-makers and quality assurance officials. Part 1: How does internal quality assurance impact employability in Bangladesh and Kenya? To be able to capture the current state of developments and identify external drivers and internal factors in quality management (QM) internationally, IIEP-UNESCO, in collaboration with the International Association of Universities (IAU), conducted a worldwide trilingual online survey during November and December 2015. The survey is the first international study conducted on the topic and thus fills a clear knowledge gap in mapping structures, processes and tools used in the quality management of higher education institutions. The information was collected to formulate policy advice to institutional and national higher education policy-makers on possible ways to enhance the development of QM in higher education institutions. The survey generated over 300 responses that were analyzed at both global and regional levels. The results of this analysis showed that QM is present in a majority of the responding institutions and that it focusses largely on teaching and learning. Building on the case studies and international survey, IIEP published four Policy Briefs for policy-makers and higher education officials in charge of academic quality. Users can draw from four themes on how to develop and implement more effective and innovative IQA systems for improved quality, employability, and management. See more on the Policy Briefs here. IIEP-UNESCO, Xiamen University and the Chinese Higher Education Evaluation Center (HEEC) joined together to organise the 2016 IIEP Policy Forum on “Higher education quality and employability: How can internal quality assurance contribute?” With support from the German Academic Exchange Service (DAAD/DIES) and the Chinese Higher Education Quality Construction Fund, the event took place at China’s University of Xiamen from 9 to 11 June 2016. The event brought together some 180 Chinese and international participants from 25 countries to discuss ways to make internal quality assurance effective for the enhancement of quality, employability and managerial effectiveness in higher education institutions worldwide. Read a synthesis from the event here. 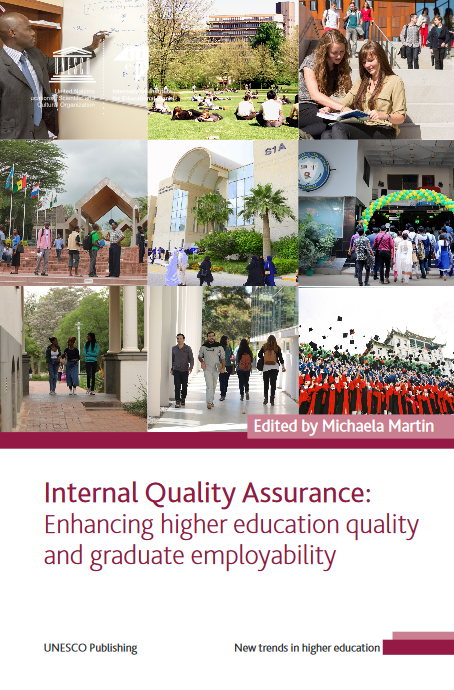 Four keynote presentations have also been reproduced and published in the book Quality and employability in Higher Education: Viewing Internal Quality Assurance as a Lever for Change. Increased autonomy for universities in Asia: how to make it work? External quality assurance in higher education: how can it address corruption and other malpractices?